Unlike the WW Jacobs short story of the same name, this doesn't involve a curse, a zombie or a $200 mortgage payment as all of those things are clearly fiction. 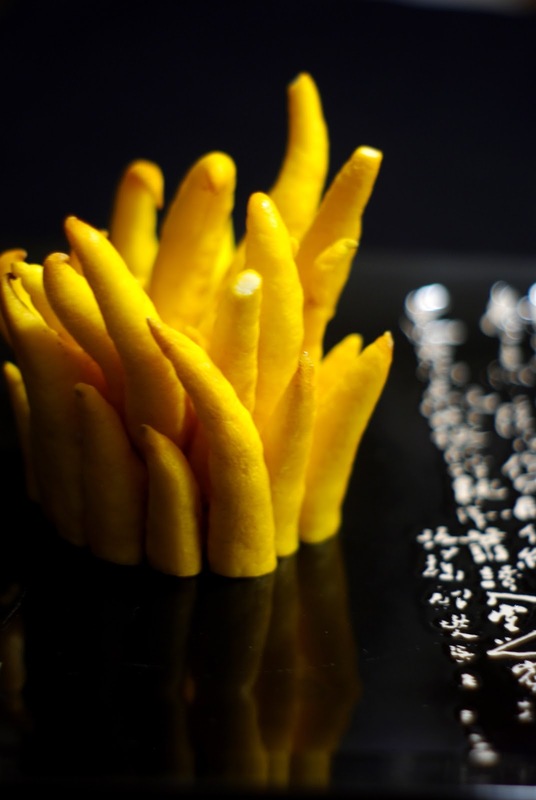 Instead this involves one of the coolest looking ingredients on earth; Buddha's Hand. A fruit that most closely resembles a genetic experiment involving a lemon and a squid. Ever since I first saw it in the grocery store, I've been looking for a way to cook this bizarre looking fruit but everything I tried was kind of ... terrible. The problem is that Buddha's Hand is all form and not much substance. There isn't actually any fruit at all. It's all peel and rind. In Japan and China where Buddha's Hand is from, it's not usually used for cooking at all. Instead it's employed mainly as an air freshener and a good luck charm (presumably for aspiring geneticists). So perhaps it is fitting that the solution to my cooking dilemma came from an entirely different part of the world: Morocco! Preserved lemons are a delicious and essential element to Moroccan cooking. Because they only involve the peel and rind, I figured that a weird lemon-squid that's all peel and rind should be an ideal fit ... and it is! Once pickled the hand shrinks and shrivels a little which was the inspiration for the name of the final dish. Quickly blanch the Buddha's Hand in boiling water to remove any residual wax, sterilize its surface and burst some of the pores in its skin. Insert it into the mason jar and add the salt and sugar. Cover with filtered lemon juice and seal the top. Leave it for a week or so on the counter, turning over periodically and then put in the fridge. It should keep for a couple of months at least. If you can't find Buddha's hand then you can use ordinary lemons or Meyer lemons instead. I happen to grow a Buddha's Hand Fingered Citron on my front porch (right between the Meyer Lemon and Kaffir Lime). I've tried them every which way and couldn't stomach them. But, they smell wonderful and add fantastic flavor to vodka when steeped. Your preserved version also shows much promise. Otherwise, I tend to send the fruit with kids for show & tell at school; or sell them to Central Market for $25 per fruit. Steeping them in vodka is a stellar idea! I also like them candied (simmer in simple syrup for a while), diced and added to a gin and tonic.